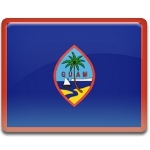 On December 8, citizens of Guam celebrate Our Lady of Camarin Day that coincides with the Feast of Immaculate Conception. Our Lady of Camarin (Santa Marian Camalen) is the patroness of Guam and the Northern Mariana Islands. Our Lady of Camarin is a small statue made of wood, except for the face and folded hands made of ivory. The statue is painted with a pink and blue gown. It origins are unclear. According to legend, this miraculous image of the Blessed Virgin Mary was found by a fisherman in the 17th or 18th century. Currently, the statue sits in the Dulce Nombre de Maria Cathedral Basilica in the island's capital of Hagåtña. The feast day of Our Lady of Camarin coincides with the Feast of Immaculate Conception. It is an official public holiday in Guam. The feast is celebrated with special church services and masses. The celebration also includes a procession around Hagåtña. On December 8, the Basilica is closed. The statue is taken down from the apse, groomed and placed atop a cart decorated with flowers. Although Our Lady of Camarin is the patron saint of the entire archipelago, the citizens of the Northern Mariana Islands do not celebrate her feast day. However, for them December 8 is also a public holiday, Constitution Day.